Blog Links to Examining the 'Mound Builder's Calendar Stone' parts One, Two, Three, Four, Five, Six. Recently I saw one of the 'artifacts' contained in my great-grandfather's book, Sacred Symbols of Mu, shown as proof that the first indigenous people of the Americas were the Washitaw de Dugdahmoundyah. My great grandfather captioned the artifact to be a "Mound Builder's Calendar Stone," as shown below. In the website linked above, it has become the "Washita Calendar Stone" and you already know there are other names as well. The use of my great-grandfather's name and/or theories to bolster or support the claims of the Washitaw de Dugdahmoundyah to be the only indigenous people of America were discussed in the following video entitled "James Churchward and the Muurish Empire Washita," released in June 2010. In summary, the use of James Churchward's name and theories to support or lend credibility to the theory of a black indigenous people in North and Central America is academic and scholarly fraud. While there may be other compelling evidence to suggest some validity to their claims, my great-grandfather's writing provide none to that end. Although an image of the "carved sandstone boulder" is contained in the book, Sacred Symbols of Mu, authored by James Churchward, there is nothing in the discussion of the artifact that links it to Washitaw de Dugdahmoundyah, except that it was said to have been found in the Ouachita River, in Arkansas. One of the tenets of the Washita is that they link themselves with a 3500 year-old mound structure in Ouachita Parish, Louisiana, but that is not where the calendar stone was found, despite the similarity of the names. PS I attempted to communicate with the 'Empress of Mu' prior to the planning of the podcast episode above and have left open any and all avenues of communication. I will continue to make myself available to discuss this issue with the 'Empress of Mu' and/or her representative at their convenience. A MOUND BUILDER'S CALENDAR STONE.-- Dimensions. The stone is pear shaped. Length about 16 inches, and about 13 inches across at its widest part. "It is a sandstone bowlder such as found in shale near Hot Springs. It weighs 22½ pounds." Description. In the center is a slightly raised ring 7¼ inches in diameter. This ring is divided into thirteen equal divisions. On each division is inscribed a figure or a glyph. Superimposed on this circle is another which is much higher. This, I presume to be meant for a picture of the Sun, as the symbol of the Deity. Above this main figure is engraved a caption, the Moon in its various phases during a calendar month. This tells us the meaning of what is below, namely: the circle with the thirteen divisions represents thirteen calendar months, making one year. The thirteen months, forming a circle, tell us that the year is completed, the beginning and the end. Over the caption is shown the All Seeing Eye looking down from heaven above. This is an ancient symbol dating back to the earliest writings, and universally found. Outside of the calendar proper, to the edge of the stone, various animals are shown, including Man. This is too indistinct to say positively what is meant or represented. However, it appears to be a bird with wings outspread. If this is correct, then it probably would be the American Indian Thunder Bird. This seems to portray the Maya month of Zac, the white month, when snow covers the ground with a white blanket. This is a new symbol to me. I do not know its meaning. This is a fish which is symbolically heading upstream, denoting that during this month fish are most plentiful, the time when they make their spring run up to their spawning beds. This glyph is one of the letters in Mu's alphabet. It has an esoteric meaning. This is a picture of the Sacred Lotus flower, Mu's floral symbol. The lotus was the most beloved and revered of all Mu's symbols. The Egyptians always ref erred to Mu as the Lotus. Without this is a line drawing of the head of the Mound Builders' conventional serpent. I do not know what it is. Among the etchings at the Pipestone Quarry, Minnesota, there are some that are almost identically like it. The Pipestone are without question the heads of the Serpent. This is a sacred symbol common in Oriental countries. Once, and only once, before have I found it in America. That was among the Mound Builders' remains taken from one of their burial grounds. It is one of those ancient religious symbols whose meaning was lost when the Brahmins persecuted and drove their teachers, the Naacals, out of India into the snowcapped ranges of the Himalayas about 2000 to 2500 B. C. The meaning of the symbol is expressed in four words of the ancient tongue. These words were used before the commencement of a supplication, or prayers. They are being repeated to this day but the priesthood does not know their meaning. The meaning of AUM was forgotten about the same date. So far in months 6 and 8 we find a direct connection between the people who made this calendar stone and the Mound Builders, Mu and the Orient. This glyph is new to me. It appears to picture ripe grain being cut and harvested. The time on this stone is given about August or September. It would thus correspond with harvest time when grain is reaped and stored. This symbol is frequently found in ancient writings. It pictures the fall of the year when trees and shrubs shed their leaves, leaving the branches bare and leafless. This is one of the most conclusive symbols on this stone and directly connects the makers of this stone calendar with the Mound Builders, the Polynesians, and therefore, Mu, as their ancestors came from the Motherland. The symbol is the Grey and Black Pointed Spider, which is discussed later in this chapter. I have received information that similar spiders have been found among the treasures recovered by Schliemann in ancient Troy, Asia Minor. These, however, I have not seen. This symbol is questionable. Is it the outline of a deer? This is certainly an outline drawing of a bison. It is now the last month in the year, the head of this buffalo is pointing in. Is this the time of the year when food has become scarce further north and he is now working in to the south where conditions for the time being suit him better? I think so. The same question applies to the 12th, the deer. Comments. There are various animals shown on the outer side of the stone. These I have not taken into account although two are very prominent in ancient picture writings and in Indian legends. It must be apparent that the designers of this Calendar Stone were acquainted with the Cosmic Forces and the Cosmic Sciences as taught during the First Great Civilization. Therefore, America at one time was enjoying the highest civilization the earth has ever known. Next we'll look at what other information found on the internet says about the stone. Continuing the research on the artifact shown on page 230 of the 1932 Sacred Symbols of Mu, my web search yielded 2 links. One was to a New York Times article, reprinted in the July 1, 1933 Arkansas Catholic. The other to the Manataka Indian Council and an email link to Lee Standing Bear Moore with more information on the stone, that Mr. Moore calls the "Manataka Stone." First let's tackle the Arkansas Catholic article entitled, Curiously Carved Stone Found in Arkansas May be the Original 13-Month Calendar. The article, a reprint attributed to the New York Times, contends that the Calendar Stone was uncovered by erosion from a mound near the Ouachita River by an unnamed boat-builder and presented to Colonel Fordyce. Shaped like a flattened human heart, 15 inches long, 12 inches wide, and three inches thick in the middle, the stone bears a highly polished disk, in the center of which a small hole is etched. The disk is raised about 3-16 inch above a ring 1 1/8 inch in diameter. This is divided into thirteen spaces, approximately the same size. Upon the surface of each space is etched a design, evidently the name for a lunar month. Etched in relief outside the circle are a number of figures and conforming to the curve of the circle the five phases of the moon are carved. Around the edge the carved figures ace to the right. They include the head of a whale; a large human eye, though from its stem it maybe a college boy's pipe; a fish, an alligator, a swimming bird, a human head with a prominent Roman nose, a turtle, and a scorpion which shoots a zig-zag line across to the eye. Next is the information supplied by Lee Standing Bear Moore and the Manataka Indian Council. Continuing the research on the artifact shown on page 230 of the 1932 Sacred Symbols of Mu, my web search yielded 2 links. One was to a New York Times article, reprinted in the July 1, 1933 Arkansas Catholic and discussed in this previous posting. The other to the Manataka Indian Council and an email link to Lee Standing Bear Moore with more information on the stone, that Mr. Moore calls the "Manataka Stone." This posting covers the information gained from Lee Standing Bear and the Manataka Indian Council. The book, "Sacred Symbols of Mu" is largely discounted by the Department of the Interior, Hot Springs National Park Service. The NPS refers to the object as the "Calendar Stone"
The Manataka Stone was discovered inside one of the ceremonial caves on the sacred Manataka mountain. It was kept by a private individual for several years until it was taken to the 'government house' here at Hot Springs where it was frequently used as a doorstop by the federal agent in residence. A study was done by a professor from Boston circa 1921, who made a dark pencil etching of the actual stone and the picture of the stone is a copy of that etching. Immediately after the report was completed the Calendar Stone disappeared. Presumably, the stone was taken to the Smithsonian Institute in Washington, D.C. However, the Smithsonian and the Department of the Interior say the location of the Calendar Stone is not known and it was a phony dreamed up by the author of Sacred Symbols of Mu who copied information from Col. John Rison Fordyce. We know this is true because of a report written by Colonel John Rison Fordyce (1869-1939) sometime in the early 1930’s. Col. Fordyce obviously personally measured the stone. 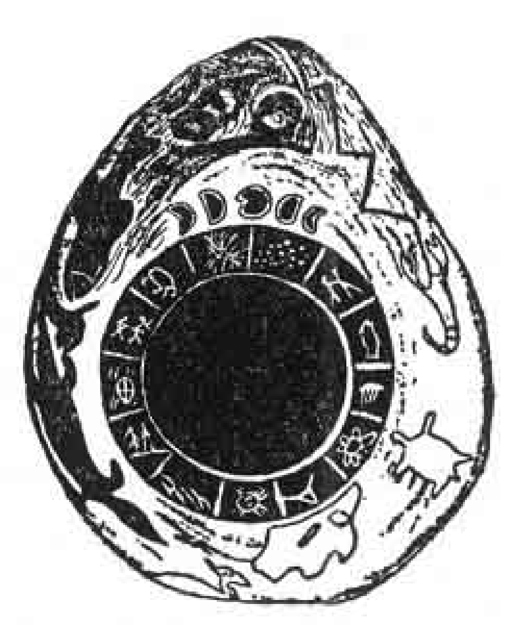 See Attached "Manataka Calendar Stone"
You will find that Col. Fordyce’s report contains references to "Mu". This report is most likely the source for your grandfather’s assumption that the Calendar Stone came from "Mu". Col. Fordyce was a promoter of sorts and often engaged in fanciful descriptions about Hot Springs history and indigenous artifacts inherited from his father and grandfather, Samuel Fordyce. Therefore, your g-grandfather copied the Fordyce report – a report that was not correct in its descriptions of the thirteen glyphs found on the stone. For some reason, Fordyce also alleged that the stone had been recovered from the Ouachita River where it had been for several centuries. We know this is not correct because the stone is made from sandstone, and sandstone quickly disintegrates in water. We were informed by a group of Mayan elders who visited Manataka in 2003 that the calendar stone came from their ancestors, the Tula. The Tula were also the ancestors of the Toltec residing approximately 65 miles NW of present day Mexico City. The Tula people sent a large group to Manataka long ago and they established a village called Tanico located at today’s Caddo Gap in the Ouachita Mountains about 45 miles NW of present day Hot Springs, AR. Interesting enough, the same sandstone material used to create the stone is abundant at Gaddo Gap. Today, we are the keepers the true meanings of those symbols shown on the Manataka Stone. We do not know of any more authoritative information available about the Manataka Stone aside from the Elders of Manataka. One thing we do know is the Manataka Stone, the Calendar Stone and the stone pictured in "Sacred Symbols of Mu" are obvious the same object, but none of them were from the Washitaw people. Your g-grandfather somehow made a wild assumption about its origin without any hard evidence other than the Fordyce report that was erroneous. These people promoting the Washitaw de Dugdahmoundyah must not be concerned about accuracy. We heard sometime back that the title of their group was taken from a story that was a joke – Dug-Dah-Mound-Yah. Sounds like a rap song. The real meanings of some of the symbols engraved on the stone cannot be revealed to anyone outside the Elders of Manataka. We searched for over twenty-five years for that information and when I was about ready to give up, the Mayan Elders appeared here at Manataka and resolved many of our questions about their meanings. There still remains a number of questions about the meanings of the symbols, but the biggest open question is about the star map in the middle of the circle surrounded by the symbols. We can say with some certainty that Fordyce’s interpretations were nearly 90% incorrect and he completely overlooked largest most meaningful depiction, the star map, in his interpretation. Further information about the Manataka Indian Council can be found on their website or in this article entitled, "DID ANCIENT STAR PEOPLE COME TO MANATAKA AND DEPOSIT WISDOM OF THE COSMOS IN A SECRET CRYSTAL CAVE?" It would only be fair to follow up the National Park Service, so stay tuned for the next installment where we cover their response to my email and sources that actually have seen the artifact. Our examination of the Mound Builder’s Calendar Stone that appears on page 230 of the 1932 Sacred Symbols of Mu by my great-grandfather, James Churchward, continues with the response I received from the National Park Service. Nobody has to twist my arm to make me admit that my email to Tom Hill, Curator of the Hot Springs National Park was not only answered in a timely manner, but extremely thorough as well. My sincere thanks go out to Mr. Hill who went above and beyond the call of duty in his response to my request for information. 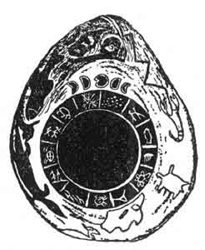 Not only did he provide references to the 'Calendar Stone' in print, but also consulted with knowledgeable individuals and provided other links to real information about the genuine article. Until now in this examination of the Calendar Stone, it has relied on accounts by people that have never actually seen the original article. Stone Calendar: Arkansas, USA 500 ad. - 1000ad. Dark basalt in a tear shape form. Along the outer edge of the stone there are nine figures placed around thirteen rectangles that contains geometric designs. In the center there is a smooth flat plain with a shallow hole in the center. Ettween the point of the tear and the rectangles there are five phases of the moon in bas-relief and above the moons there is a design in the form of a mound that contains a dimond with a circle in its center. Due to copyright restrictions I am unable to reproduce any images from the downloaded pdf. Dr. Early added that Sam Dickinson acquired John Fordyce’s archeological and historical files, and he eventually placed them along with his own in the Cammie Henry Research Center in the Watson Library at Northwestern State University, in Natchitoches, LA. One can see a box inventory list of the Dickinson collection on their web page. There is one box labeled "calendar stone," and it had a proviso that it was not to be opened till after Sam’s death. Sam has passed away, and when Dr. Early was in the center about 4 years ago, looking through the Fordyce papers, she took a quick glance in that box. The stone is not there, as she recalls. There were only some newspaper clippings and a few other documents, and photos, in the box. There are a great many files in the Fordyce portion of the Dickinson collection, but Dr. Early only got to go very rapidly through about half of them. She did not find a file of information about where Fordyce got the relics that he purchased. She explained that Fordyce acquired pots, thousands of lithic artifacts, and many plains Indian ethnographic items. Anyway, she says the stone itself has been around since the 1930s, but is clearly not an ancient artifact. Dr. Early is not sure where it is though, or if it still exists. The final part of the examination of the 'Mound-builder's Calendar Stone' covers a book that shows a photograph of the artifact and devotes a few pages to it. The conclusion of the examination of the Mound Builder’s Calendar Stone that appears on page 230 of the 1932 Sacred Symbols of Mu by my great-grandfather, James Churchward, continues with the response I received from the National Park Service. Again I must reiterate that Tom Hill, Curator of the Hot Springs National Park, was extremely helpful and provided some excellent references about the artifact in question. Some of the references were discussed in Part 5. Additionally, Mr Hill pointed me to the book Didn't All the Indians Come Here: Separating Fact from Fiction at Hot Springs National Park by Mark Blaeuer. The book contains a copy of a photograph of the artifact and devotes a few pages to the discussion of the item. In Mr. Blaeuer's book, the artifact is known as the Arkansas Calendar Stone and the text mentions that no one has reliably recorded when the object was "found." (quotes from original) Other facts gleamed from the book include that the stone may have been made of quartzite and that Fordyce may have had two such stones in his collection. The one 'almost perfectly round' found it's way into the storage area for the Arkansas Museum of Science and History in Little Rock and the other 'pear-shaped' stone was sold to a lady in Houston, Texas. Another website's article contains a sequence of diagrams purporting to show the connection of the stone to "The Great Pyramid of Giza," "The Light Cones of Relativity," "The Great Pyramid's 'invisible' twin created by the full extension of the of the Pi dimension", and "The completed 'hourglass' of Orion's Belt." Both articles reproduce what appears to be Churchward's drawing of the pear-shaped stone. Yes, your photograph is of the fake calendar stone which so intrigued Colonel Fordyce and numerous other people. The interest that the New York Times article excited shows how eager people are to believe the irrational. The stone itself looked newly carved." So, whether it is called the "Mound Builder’s Calendar Stone," "Washita Calendar Stone," "Manataka Stone," or the "Arkansas Calendar Stone," apparently quite a few folks have been been led down a path of fraud and deception. This does not mean that any of these people were involved in creating the fraudulent artifact, however, one must suspect their interpretations since the item was manufactured in the late 19th or early 20th century and was not, as they previously believed, an ancient artifact.